We felines, despite what some say, tend to bond with our humans. We become very sad when we lose them. Then to make things more difficult, we often are sent to shelters. Being sad about losing our human and being in a strange place means we are not as furiendly as we normally are, and sometimes, we do not get out of the shelter. That is what happened to Sadie. She loved her human, and she was used to her human waking up to give her noms. One day, her human did not do that, so Sadie went to see what was wrong. Her human was not moving, and Sadie talked to her to wake her up, and tried paw taps as well. Sadie’s human did not move, so then Sadie decided to curl up on her chest to keep watch. A few days later, some humans came to see if Sadie’s human was okay. When she was not, they took her away. Sadie did not want this to happen, but they said they had to so she let them. Then other humans came to move things from the home. 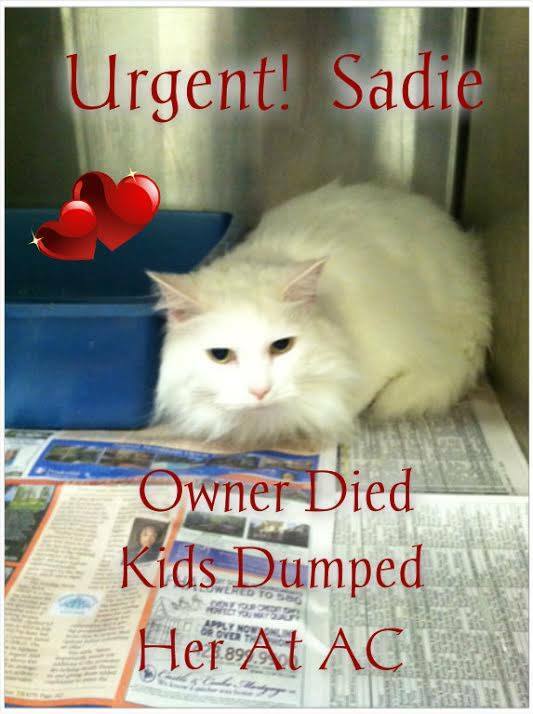 The humans who came did not take Sadie with them. Instead, they took her to the shelter. She was not happy, and she knew her human would not be happy. How could you just dump a lifetime furiend of a family member you just lost? 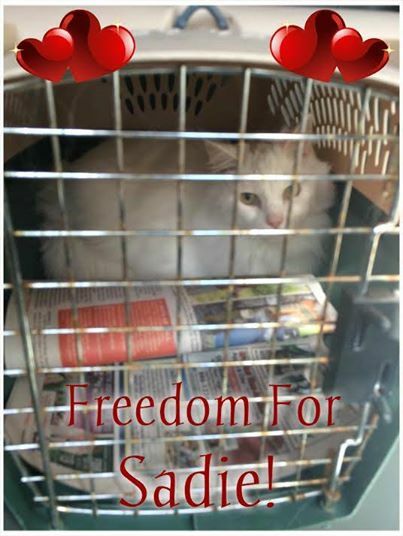 Fortunately for Sadie, Angels Among Us Pet Rescue decided that she could not be left in the shelter. They started a cat rescue, and Sadie was pulled from the shelter so that she could find another human who loved her. She is only seven, and has a lot of love left to give. Next in this cat rescue story was a trip to the humans in white coats. There, Sadie was found to need some dental work. Her teeth and gums were damaged by a bacterial infection. One of the humans in white coats cleaned up her mouth, but she will need to see a specialist to have some teeth removed. But there is some good news for Sadie. The next step in her cat rescue is finding a home. Angels Among Us Pet Rescue says that they have some applications in for this. I am glad that Sadie’s cat rescue will turn out well. Angels Among Us is looking for help with green paper things. If you can help, please send some their way and put Sadie’s name in the purpose line. If not, please share her story. And remember, it is very important for you to make sure that if something happens to you, your four legged furiends will be taken care of!